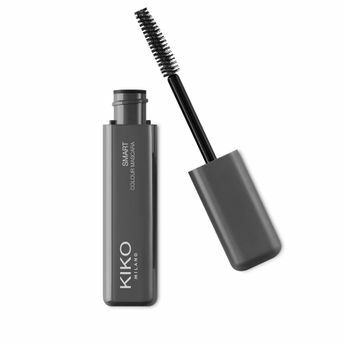 Panoramic volume-effect Smart Colour Mascara by Kiko Milano has a luxuriously creamy yet light texture.It is easy to apply to even the shortest lashes and releases an intense, highly-pigmented colour. It can be used on its own or as a top coat over black mascara, to give the eyes a touch of colour. Triangular-shape fibre brush provides great performance of in terms of volume, length and definition. It is guaranteed by the perfect combination of the thickness, density and length of the bristles.The inner parts of the brush, where the bristles are shorter, hold the product and guarantee an immediate release, whereas the longer bristles comb through the lashes, ensuring a high-definition effect. About the Brand: A true revolution in the beauty arena, Kiko Milano is a leading Italian brand of makeup, beauty accessories and state-of-the-art skincare products.Founded in 1997, Kiko Milano is constantly committed to a single objective: to allow all women to treat themselves to the most innovative cosmetics without having to sacrifice their budgets.Of the Kiko Milano makeup and skin care formulas, 97% are produced in Europe (3% in USA, Korea and Japan), which ensures high quality and safety, also all ingredients meet strict requirements as required by law (including no animal testing).</p><p>Kiko does not carry out or order testing on animals, pursuant to the relative European laws. Alternatively, you can also find many more products from the Kiko Milano Smart Colour Mascara range.